This manual has its origins in the need for a book to codify standardized method for testing and evaluating poultry vaccines. The National Academy of Sciences sponsored the original publication entitled Methods for the Examination of Poultry Biologics, and completed two successive revisions. In 1975, the American Association of Avian Pathologists (AAAP) accepted responsibility for the publication, but because the need for standardizing testing of vaccines had been met, the scope and purpose of the manual was broadened to be a resource for laboratory procedures for the isolation and identification of disease-causing agents. 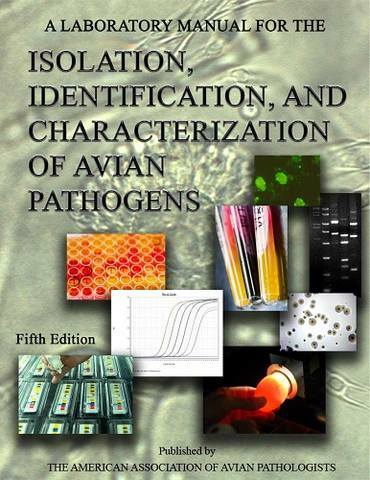 The title was changed to Isolation and Identification of Avian Pathogens for the 1st edition and to A Laboratory Manual for the Isolation and Identification of Avian Pathogens for the 3rd edition. The manual was intended as a bench resource for daily use in the diagnostic laboratory. With the 4th edition, the focus had shifted from a manual of procedures for isolation and identification of pathogens to a more encompassing manual for diagnosis of the disease and isolation and/or demonstration of the pathogen. This change was needed because many clinical specimens are presented as unknowns for determination of etiology and some pathogens are difficult to isolate, but can be demonstrated with newer molecular or immunologic techniques. With the 5th edition, the AAAP appointed Dr. Louise Dufour-Zavala as Editor-in-Chief. David Swayne served as advisor to the Editorin-Chief and section editor. John Glisson, Willie M. Reed, Mark W. Jackwood and James E. Pearson continued as section editors for their expertise in bacteriology, veterinary diagnostics, molecular biology, and virology. Peter Woolcock was newly appointed to support the virology section. The 5th edition has a new title to reflect the molecular advances and modern testing procedures allowing us to characterize, type, speciate and serotype several avian pathogens. It also has a new chapter on Turkey Coronavirus. A color plate with tissue culture images is included. Improvements to individual chapters include updated terminology and information on molecular techniques. _ In the appendix section, we removed the appendix of sources and the appendix ofreference antisera as they are now readily available on the Internet. The editorial committee thanks all of the 67 contributors who prepared new chapters or revised existing chapters for the 5th edition. We also thank Crissie Boyd, Georgia Poultry Laboratory Network, for her tremendous clerical support in formatting the Manual. We thank Heidi Migalla, HMM photography, for the design of the cover and Aaron Nord at Omni Press for the printing services.